Mitt Romney currently trails President Obama among registered Latino voters by nearly 40%, and getting caught saying things like "it would be helpful to be Latino" certainly isn't helping. But has it gotten so bad that Romney is now resorting to "brownface" in order to make himself more appealing to Univision viewers? 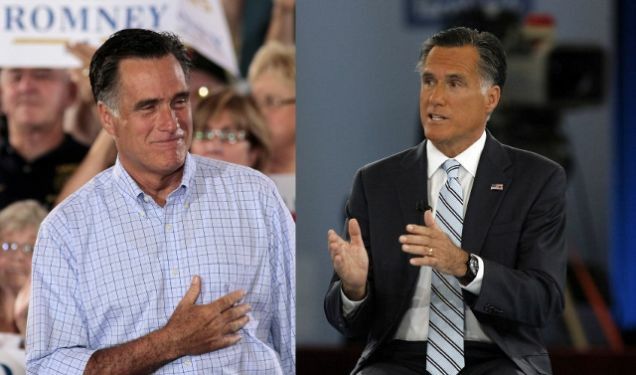 Democratic Underground has looked at the photo above from last night's "presidential forum" and concluded that, yes, Romney definitely "dyed his face brown." Wonkette wonders if perhaps the GOP nominee was involved in some sort of "self-tanner accident" or perhaps went out tanning with John Boehner "for a little pick-me-up." Mitt Romney is certainly looking more crispy than usual, but is that enough to call him out for, as Gossip On This put it, trying to win "browning points"? Maybe he's just putting his Snooki love to practice.